Mask is one of the central metaphors in our work and we use both full-faced and half masks. We work with the notion that everyone wears 'masks', some as a habitual coping strategy, others more consciously. 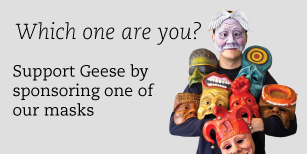 In our performances and workshops, audiences are invited to ask characters to 'lift their mask' and can question them about the thoughts and feelings that inform their apparent attitude or behaviour. This technique enables audiences to explore the distinctions between external presenting behaviours and internal experience and can prove to be incredibly motivating for audiences and group members.